I sometimes wonder about Jesus. And I wonder what people would say about him if he lived in my neighborhood. I suspect that you would find him, if you were the inquisitive sort, at Joe McGovern’s Tavern on the Bayfront after he left the cabinet shop down the road. He would be eating fried flounder and drinking a beer, listening to fish stories the men who frequent Joe’s liked to tell. He would look out over the water and see the lights of the flounderers gigging the flat fish in the shallows of Mobile Bay. He would listen to the men, who smelled of day-old sweat and too many yeasty brews, as they squinted through the blue smoke from their cigarettes. He would laugh at their jokes and look at them with eyes that look right through you. And they would look back at a man with big hands and sawdust in his hair, one that listened hard, like he really cared what you were saying. In Alabama we don’t hide our religion in a broom closet. Spirituality is not so much a private issue as I have heard that it is up north. We aren’t embarrassed to say, “I’m a Baptist, a Methodist, a Born-again-twice-blessed-Pentecostal Brethren. Or he’s a Catholic, a Jew, or a reprobate.” (Chances are, too, we knew somebody who was the latter and one of the other categories at the same time.) We get out more, I suppose. Out in the woods and out on the water. It is hard not to be spiritual, even if in an unorthodox way, when you walk out under the moss-hung oaks and hear the whispers on the bay breeze, the whispers of long dead loved ones and of enemies, and of people gone on ahead. Everybody in Mobile is religious, it seemed to me. Even—or particularly—fishermen, though frequently they didn’t seem very pious. But rare is the fisherman of my acquaintance that doesn’t tip his hat to God now and again. Just to be on the safe side. Too many fellows have gone out on a sunny day and not come back after the sudden storm. But, if Jesus lived on Bayfront road there would be talk. Of that I am sure. There always is. Church people can be the meanest flock of birds in the world. Like a yard full of chickens that peck another hapless biddy to death because of a spot on her head. Dad quit the church for a while once because the Deacons were pecking away at the preacher in a squabble. When he could stand it no more my Dad embarrassed me to death: he stood up in a business meeting, leaned on his good leg and requested that his name be struck from the church rolls. He would have no part in the fight. He had been the Chairman of the Deacons, too—until then. The fight was about which side of the church we would put the organ, I think. No, it wasn’t really about that at all, when I think about it; that’s just what people said it was about; what they talked about. It was really about who was in charge, the Preacher or the Deacons. People and chickens, just the same, it seems. The Church had a Youth Camp down on the bayou with a weekend of meetings, singing, games, and preaching by an itinerant youth evangelist just five years older than I was. All the girls were in love with him and all the boys wanted to be him, even if only to have the girls love them. He shared a cabin with me and four other boys. Since I was in charge of the sports equipment and had worn myself out trying to keep up with volleyballs, softballs, bats and horseshoes for forty or fifty careless teenagers, I got to take a nap one afternoon during the fifth evangelistic service of the weekend. I walked into the cabin where the suitcases were laid out on the bunks. One beat-up tweed suitcase stood open. I wasn’t snooping, but I saw there, stuck in the corner under a pair of socks, a pack of Camels. Cigarettes are very much against the rules at a Youth Camp. Smokes are an unholy vice, as everyone knew at my church, since smoking was declared a venal sin, along with drinking, rock and roll, and dancing, of course. Cigarettes on the hollowed grounds? Appalling! And what is more, the suitcase lay on the Preacher’s bunk! I did not sleep well during my nap. I was at once horrified, disappointed, angry, betrayed and bewildered. “The nerve of that man! To preach holiness to teenagers in ponytails and tee shirts; to exhort kids in white socks and poodle skirts to strive for purity and all the while secretly winking at his own sins! He is just like all the other men folk who stand around on the back stoop of the church house, smoking between services and then go in to pass the offering plate, their breath still smelling of tobacco.” I woke up with a headache. I waited sullenly, until my righteous indignation turned to smoldering shame. After the kids spilled out of the chapel back into the cabins, Billy, a pre-delinquent thug, sauntered into the room, shut his suitcase and moved it from the preacher’s bunk up onto his own. 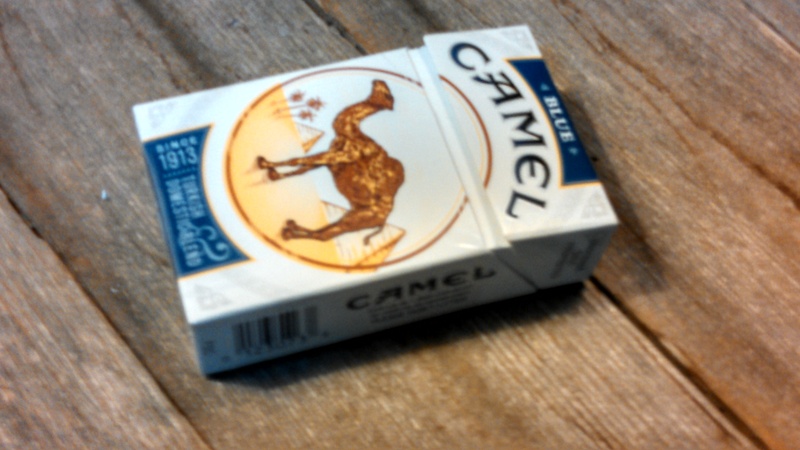 If Jesus lived in my neighborhood, I wonder if he would smoke Camels. It probably wouldn’t matter. People would think he did. The church people would disapprove. He would smell of the smoke of Camel cigarettes because he spent too much time at the tavern loving fishermen. I love this and I am looking forward to reading more. Thanks Sam ! !